As I walked into the concourse area at the newly completed Tigue Moore Field at Russo Park on Thursday evening, I didn’t really know what to expect. For one, I had purposely waited to view UL’s new ballpark until it was closer to completion. For someone who vividly remembers trying to maneuver the archaic scoreboard in the leaky press box three decades ago, what a jewel. Secondly, I wasn’t quite sure what kind of gathering I was walking into. 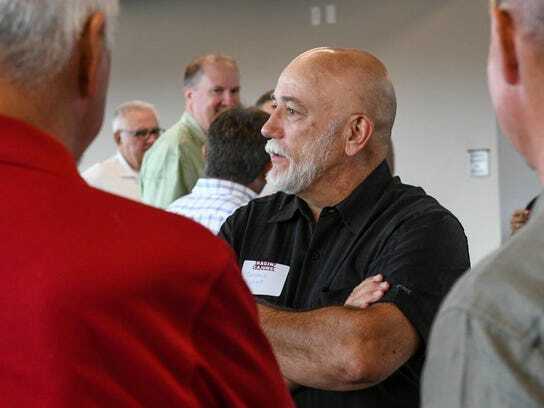 It was a baseball reunion of the Burger Chef American Legion teams in the 1970s and Roughnecks semi-pro team that spanned into the 1980s. Truthfully, those clubs were just a little bit before my time, but oh, had I heard the stories. In the mid-1980s, I began working for Tigue Moore as the P.A. announcer and statistician for his precious Third District West league. Many a night in that press box I heard the stories from former coaches and players about how good the baseball talent was in the 1970s in this parish. On Thursday, in the first official function in the new stadium club at Russo Park, what was largely legend to me became reality. 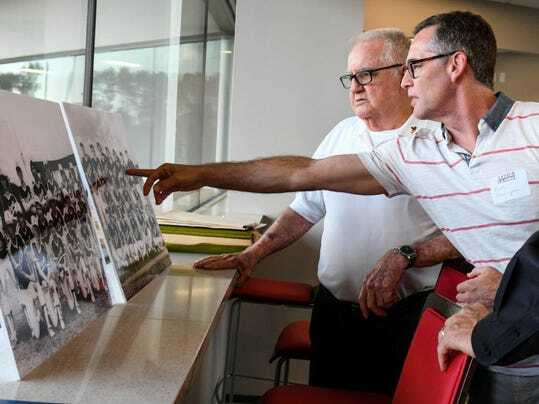 Oh sure, some of them I knew — guys who hung around the local sports scene in various roles like coach Gerald Hebert or Gerald Broussard or Garrett O’Connor or Leland Padgett. Most of them, though, were names I’d heard stories about years ago when Legion ball was still the most important sporting event of the summer. It still held that distinction was when I arrived over 30 years ago and it certainly was a decade before that. There were scrapbooks filled with the chronicling of their exploits. These were teams with seven and eight Division I prospects. Asked who were the best players, Randy Olson stopped, thought and just couldn’t come up with an answer. The bond between the figures of that special era of local baseball remains strong. Raymond Richard came from North Carolina. Steve Selcer and Bill Lastrapes came from Georgia. Three-sport letterman David Guidry came from Florida and others, like Dennis Foret, from Houston. Ask the coach and Richard was the best Major League Baseball prospect out of the bunch. He did play two and a half seasons in the Indians organization. Although the bulk of the group came from Lafayette High, Richard was from Cathedral-Carmel. He actually played basketball for two years at Southeastern, before transferring back to Lafayette to play hoops here. After running preseason conditioning drills with a freshman at his position named Andrew Toney, Richard returned to baseball. He was on the first Cajun team to play at Moore Field when it opened in 1979, along with future Major Leaguer Jose Alvarez. The other unmistakable fact was — in addition to being supremely talented — this group was filled with more characters than one baseball program should have. Many of the stories can’t be told here. After all, it was the 1970s. The consensus seemed to be Bryan Culotta and Leland Padgett were tops on the crazy-meter. “All of that ended 14 years ago,” Culotta laughed. In addition to the stars, there were the unsung heroes, like assistant coach William Ryckman Sr. As Padgett detailed with great energy, Ryckman would show up to the park, rip off his suit after a day at IBM and incredibly spray line drives wherever he wanted off live Hebert pitching. It certainly worked. Burger Chef made it to the state finals four out of five years — twice losing to the eventual national champions out of New Orleans in that stretch. The other bond easy to notice was the mutual respect for Tigue Moore. 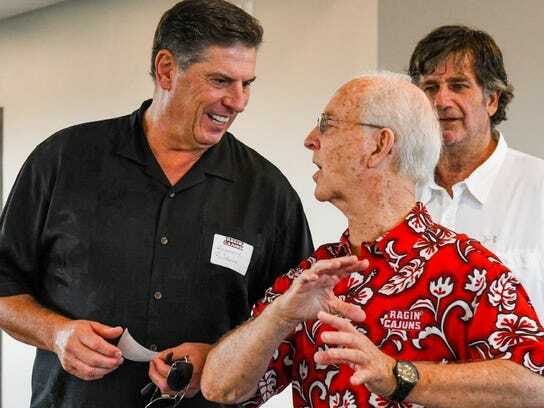 For most of them, as much as they didn’t like his rules as teenagers, they now respected him for all he did for baseball in Lafayette Parish. Indeed, when Hebert set the record straight that Tigue Moore’s name “will never, ever be removed from this field,” the news was met with unanimous approval. MORE: Will atmosphere at The Tigue change with renovations? Many of those Burger Chef Legion stars later played for the Roughnecks, also coached by Hebert. As team organizer Gil Padgett explained, the Roughnecks were created after the Giants’ affiliated Double-A team the Lafayette Drillers left the area for Tulsa, Okla.
Reggie White and Padgett formed a semi-pro team that played 40 games in that first summer of 1978. Soon, there were similar teams in Morgan City, Lafayette, Baton Rouge and Shreveport. One season, the Roughnecks finished third nationally, beating the defending champion from Birmingham, Alabama, in the semifinals, but then losing to eventual national champion Ohio in Louisville, Kentucky. In Padgett’s estimation, outfielder Gary Wooley was the top performer on those teams. “And he had the mouth to go along with all of his talent,” laughed Padgett. Although Tigue Moore would love the fancy new ball park, he would be devastated by the current state of summer league baseball that has all but pushed American Legion ball aside. For one night, though, in the park still named in his memory, American Legion baseball at its best was alive and well. Click here (then scroll down) for the photo gallery of "The Tigue: The Early Years"